LPL offers complete programs for Infants, Toddlers, Pre-school, Kindergarten, Before & After School and a Day Camp Program. 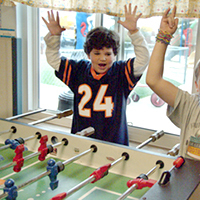 Most of our facilities accept children ages 6 weeks to 12 years. Our programs are designed to encourage all ages to discover, to explore, and to lay a foundation for a lifetime of learning. We make learning fun and entertaining. Our buildings and playgrounds are designed with a nautical theme to appeal to all ages. We have several fish tanks throughout the schools. Some are very large and others are mounted between classrooms at ground level so the very young children can enjoy them as well. Our goal is to positively affect the normal growth and development of your child. The child growth and development techniques used at LPL are based on the real experiences of the children on a day to day basis which change as the children change. We believe that children need to master skills that will enable them to learn more effectively and efficiently. We believe that going to a child care center should be an enjoyable experience as well as an educational one. To that end we have designed playgrounds that have the safety of the children at the forefront of our design. The apparatus and play areas also exercise large and small muscle groups, enhance hand-eye coordination, fine tune motor skills, provide for both individual and group activities and provide “quiet” areas where the child who enjoys reading or story-telling can relax. Our curriculum has been developed and fine tuned over the years. We provide the children with the basics of "learning how to learn" which gives them a strong foundation. Equally as important, we provide each child with the socialization skills necessary for entering elementary school. Little People's Landing "Thematic Curriculum" has been designed to enrich all of the areas of a child's development. Our curriculum is theme based. The themes change each week and correlates to the concepts that are being taught on a weekly basis. Little People's Landing focuses on the needs of children in each area of development - Physical, Intellectual, Emotional and Social. Children will learn and develop through exploration and play. This makes each week of the year new and exciting. The children will experience many different activities, some teacher directed and some child directed. The children will explore and experience music activities, math activities, science activities, dramatic play activities, construction and block play activities, manipulative activities, literacy activities, circle time, art activities, sand and water activities, gross motor activities, and fine motor activities. All children will use a variety of media to encourage exploration and imagination. Just look at our Thematic Curriculum Calendar to see the wide variety of themes that encompass historic, social, and general knowledge topics. Parents will get feedback on their children by way of progress reports, evaluations, and parent/teacher conferences. The information below will help you build an understanding of what your child does in his or her classroom each day. We encourage you to read the information, and then you'll be able to ask your child with confidence, "What did you do in school today?" Literacy development helps children build an understanding of language and literature. It includes listening, speaking, reading and writing activities. 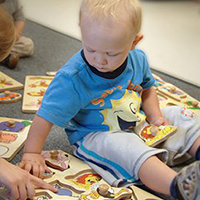 These activities help build skills in areas such as communication, vocabulary, letter recognition, and comprehension. Story time is designed to help children develop an appreciation and enjoyment of literature. Math activities include hands-on and real life experiences. They also help children develop awareness of numbers, geometry, patterns, measurement, and graphs. Manipulative activities help children improve visual perception, hand-eye coordination, as well as problem solving and social skills. Circle time is a group gathering during which the day's plans, ideas, and observations are shared. Circle activities are designed to stimulate children's thinking, enrich their social skills, and expand their attention spans. 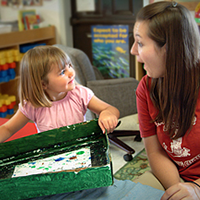 Art activities help children creatively express their thoughts and feelings. They help reinforce fine motor skills and concept development in areas such as colors, shapes, and size relationships. Dramatic play activities help children express themselves, practice life skills, improve social skills, increase self-esteem, build vocabulary, and solve problems. And dramatic play is just plain fun. Science activities offer children many hands-on opportunities for observation, exploration, investigation, making decisions, and experimentation. Sand and water activities allow children to experiment with textures and the properties of different substances. These activities also promote the development of other skills, such as math, science, and language. Block play helps children improve visual perception, hand-eye coordination, manual dexterity, imagination, as well as problem solving and social skills. Our infants (age 6 weeks to 12 months) are cared for in a nursery designed especially for them. Separate sleep and play areas allow infants to follow their individual daily schedules of eating, sleeping, and exploring without affecting the other infants. Our cribs have short wall partitions on three sides. This gives our sleep areas a homey feel and allows children a more restful sleep. Play areas are stimulating, bright, clean, and colorful to encourage exploration. 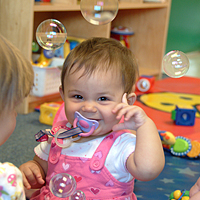 Babies are exposed to a variety of toys and activities to keep them interested and learning about their world. Our Infant Nursery Supervisors are our most experienced staff members. The education and experience requirements are much higher for this position. We have many Infant Nursery Supervisors with ten to twenty years of experience! They supervise the activities in the nurseries ensuring the safest and healthiest care for your infant. If you spend a little time in our nurseries you will notice the care and dedication of our infant staff. They change activities often for variety. You will see them singing, reading, talking, playing games, teaching sign language, and involved in other multi-sensory activities designed to expand your child’s ever growing horizons. You will also see a lot of hugs, cuddles, and comfort as they ensure your child feels safe and secure. Little People’s Landing provides baby food and our infant staff will present you with daily verbal and written communication about your child’s day. Kidreports.com is a new program being implemented at Little People’s Landing. It is an application that has the ability to communicate in real time and with the app on android and iphone, can keep parents informed on the go and conviently. It also allows us to share photos and videos of the children directly to your phone or mobile device. Toddlers are generally children 12 months to 24 months and walking independently. Our Toddler rooms are designed with your toddler in mind. Large windows allow them to observe the outdoor happenings while being closely supervised, and given a chance to relate to children of their own age. Toddler activities encourage your child’s natural curiosity and emerging independence. They spend their day with sensory activities, physical play, and group circle time. They are learning to interact with other children and adults. They begin feeding themselves. Our curriculum helps them to expand their vocabulary and early language skills through singing, story time, puzzles, games, and interactive play. Art projects develop their manual dexterity and early writing skills. Your child will enjoy a variety of playground equipment, outdoor activities, and games. Their day is full, but we still squeeze in a nap! Our teachers are skilled at incorporating fun into the curriculum. Your child won’t even realize the teaching that is taking place, but you will. We cater to the whole child with activities to develop your child’s social, emotional, physical and educational foundation. The preschool program encompasses several different classrooms that the children progress through as they get older and advance their skills. They are learning in a hands-on environment where they can use their creative abilities, expand their imagination play, and prepare their mental skills. We strive to teach them communication, manners, responsibility, respect, and other social skills they will need when entering elementary school. They are expanding their ever-growing vocabulary skills and we are introducing concepts they will use for reading and math later on. We build on the curriculum methods already in place, and expand into new avenues for learning by introducing them to computers. Over time, the preschool program and curriculum becomes more structured to prepare each child for the transition into Kindergarten. Preschool children will advance their physical skills as well. Playground activities, games, and Stretch-N-Grow exercise programs burn off energy, expand motor skills, build team skills, and help to introduce children to the importance and fun of physical activity. The day will also include rest/nap time. Children can participate in monthly field trips as the preschooler is exposed to a variety of activities. They may visit the zoo, go to the Stock Show and Rodeo, see Disney on Ice, enjoy a Circus, pick pumpkins, visit Casa Bonita, set off Estes Rockets on Rocket Day, and many other adventures. Most of the field trips center on the weekly curriculum theme, so that the children get to learn about and build excitement for their upcoming field trip. Teachers encourage the natural curiosity of preschool children through large and small group activities, and a variety of learning centers. We balance the preschoolers need for independence with their need for a loving and secure environment. Normally, one to two times per month the preschool aged children get the opportunity to explore the world outside of their school by enjoying a field trip. This is always a great adventure! There are so many places to go and see. We vary the field trips to give these young explorers a variety of learning experiences and exposure to new things. Examples of some of our field trips are: farms, gardens, Human Society, fire stations, Garbage Garage (recycling), roller skating, pumpkin patch, dairy, Disney on Ice, rodeo, circus, aquarium, zoo, the Museum of Nature and Science, and many more. We suggest, but do not require, parents to purchase an LPL “T” shirt to wear on field trips. Our kindergarten program is in compliance with all state requirements and is reviewed annually to ensure we are using the latest techniques. Our teachers coordinate with the elementary schools in their school district to ensure our programs meet each schools requirement for first grade. Our Kindergarten programs are similar to the programs provided at public elementary schools by each location, so children can merge effortlessly into first grade. Yet, because of our smaller class size, our Kindergarten programs offer more nurturing for your child then they will get in the public school’s Kindergarten program. Smaller class sizes allow teachers to spend more one-on-one time with each child and to ensure an understanding for Kindergarten concepts. Parents also enjoy daily contact and feedback with teachers. Child interaction and playground activities are also more closely supervised in our program. Field trips add fun and adventure to the program. They often center on the weekly curriculum theme, so the children get to learn about, and build excitement for their upcoming field trip. Some field trips incorporate physical activities like, bowling, rock climbing, recreation centers, and House-of-Bounce. Others are more educational, like visiting the Fire Station, Museums, the Zoo, and the Butterfly Pavilion. Either way, they are fun and expand the Kindergartener’s world. At the beginning of the Kindergarten year, some children may still occasionally need a nap. Those children who are tired can have rest time, but this is phased out over the course of the year. 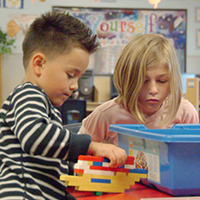 Our Kindergarten Teachers must be licensed in Colorado as a Teacher or Director. In addition, they must complete a minimum of fifteen hours of ongoing training every year. We specifically look for teachers that are well rounded to provide nurturing, education, and classroom structure. Five-year-olds are creative and enthusiastic problem solvers. They offer progressively more imaginative ideas for how to do a task, make something, or solve longer-term or more abstract challenges. As they participate in a variety of new experiences, five-year-olds ask more analytical questions and weigh their choices. They are also more social as they learn new things and prefer activities that involve other children. The language skills of five-year-olds are well developed. They pronounce words clearly, speak in complex and compound sentences, use correct grammar, for the most part, and have good-sized vocabularies that continue to grow rapidly. Children this age enjoy initiating conversations, can wait their turn to speak during group conversations and are typically able to include appropriate details when sharing personal experiences. 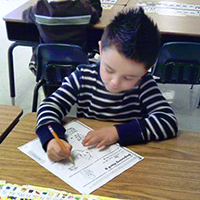 Five-year-olds begin to extend their oral language skills to reading and writing. They know their uppercase and most lowercase letters, and understand that letters represent specific sounds in spoken words. This knowledge helps them to sound out words in print and write out words based on their sounds. They also can discuss stories and are able to tell their own tales. The mathematical thinking of children this age becomes more abstract and expands to include a greater understanding of the characteristics of shapes and numbers. They can count out a collection of up to “20” items, conduct simple addition and subtraction, and identify which number in a set is larger. Five-year-olds understand and use words related to position, such as “under” or “behind.” They sequence events chronologically and are learning to tell time. They can also sort objects based on more than one characteristic. Physically, five-year-olds abound with energy and seek active games and environments. Their increased abilities to balance and coordinate movements allow them to ride a bike with training wheels, swim, jump rope and perform most ball-related skills. They show mature form in walking and running and are able to vary the direction, speed, and quality of their movements. They can also use their fingers flexibly to control writing and painting tools, dress and undress dolls and manage zippers and buttons. Five-year-olds really want to know more about how the world works. Hands-on experiences help them to form theories to explain “how” and “why” things happen. They can use tools like thermometers and scales to gather information and are able to more independently carry out simple investigations. Five-year-olds also use increasingly descriptive language to relay information, ask questions, and provide explanations. Children this age can manage feelings and social situations with greater independence. They might decide on their own to go to another room to calm down, or try strategies like negotiation and compromise to resolve a conflict before seeking adult help. They also have improved skills for forming and maintaining friendships with adults and other children. Being accepted by “the group” is becoming more and more important. In the creative arts, five-year-olds have a varied repertoire of music and are able to compose and arrange music within specified guidelines. They create realistic art with recognizable subjects and more detailed settings. They also recognize that art can tell a story. The dramatic play of five-year-olds is pre-planned, elaborate and sustained. They are able to perform simple plays, do pantomime and perform puppet shows. A perfect solution to keep children safe during the hours before and after school. Transportation is provided to and from nearby elementary schools. An afternoon snack is provided when the children return from school. Planned activities keep children entertained and involved. We also have an area for children to complete their homework. We offer Stingray Club during the school year which gives the school age children the opportunity to go on two field trips per month. The activities will vary with things like bowling, laser tag, mini-golf, movies and more. You don’t have to worry about the care of the kids when school is out of session for spring, fall, and winter breaks, or for out of service days. We plan special activities and field trips so time away from school is even better! Ou day camp program is for children ages 5 to 12 years of age. Our camp runs during the summer months while the kids are off from school and is intended to provide your day camper with a variety of safe, stimulating, and fun activities to make sure this is a memorable summer for everyone. Little People’s Landing simply has the finest day camp program for the money in the industry. We take the children on field trips 4 days a week and have an enrichment day one day a week in the summer. These field trips range from tours through various businesses, such as a bakery, dairy, etc. to hikes in the parks, fishing, the zoo, museums, and swimming trips to local “swimming holes”. Our “anchor” field trips which occur throughout the summer are: an amusement park, Rockies game, white water (kid size) rafting, and a water park. When not on a field trip, the children spend time at a park or engaging in creative activities at the center. Our enrichment day will consist of a special activity for the day. Some examples will be bringing in special guests and activities, doing all day cooking projects, or specially themed all day projects. We include all kinds of additional activities for your child and family throughout the year. We have Enrichment Activities designed to expose children to activities they might never experience otherwise. We have a number of Family Events that celebrate what's best, FAMILY! The children really love to have family visitors to their school. It makes for a very special occasion for them, and we want to provide families the opportunity to celebrate free, fun time together. We also have activities to save you time, these are activities designed to promote child health and assist you with your schedule. Most children never get the opportunity to experience rockets, but not LPL kids. Every summer our Day Camp gets to build a rocket for their school. All of our schools then gather together and launch the school rockets and 20 to 30 others built by our owners and maintenance personnel. We have a large collection of rockets in different shapes and that do different things. Aliens, lunar lander, insect transporter, baseball bat and ball, camera, and one that scrambles an egg in flight are some of the favorites. We also have some large rockets…. up to seven feet tall! Children are selected to push the ignition buttons after a group countdown and then watch the LPL staff members compete to catch and retrieve the falling rockets. It is a great annual event. Not all families like to rough it, so we give children the opportunity to experience a camp out. We set up tents in the great “out back” of the schools playground and kids bring their sleeping bags for a night of fun. Of course it wouldn’t be a camp out without roasting hot dogs on a fire and making s’mores! The fun also includes activities like storytelling, crafts, scavenger hunts, and other games. In the morning the kids enjoy a hot breakfast. You would not believe how excited the kids get for this event. At least one staff member remains awake for the entire night to ensure the safety of the children. Children get the opportunity to learn to ski from the professional instructors at Loveland Ski Area. We take care of everything including transportation, equipment rental, lunch, and snacks. This is truly a great way to start your child out in winter sports. For over 23 years, LPL has a team of staff that rides the MS150 to raise money for Multiple Sclerosis. We get the kids involved by holding a Bike-A-Thon at each school as well. The kids bring their bikes and trikes to school and ride laps. The children can also take pledges for their ride to raise money for MS. The children have a lot of fun, get plenty of exercise, and learn about charity. Our playgrounds vary by school and by age group. Please check out our virtual tours to see the different playground equipment at each school. In addition to the static playground, we have a variety of toys and activities for outdoor play. Introducing new games and science activities also add to the fun! Of course in the summer, we add water! Every January we head out to the National Western Stock Show with the children. They get to experience all the sights, sounds, and smells of the big stock show, see a rodeo and visit the petting zoo. The Easter Bunny loves LPL and visits us every year. Willing kids get to take a picture with the Easter Bunny and we have some egg dying and egg hunts to practice for the big day. Field day challenges kids to get physical with fun running and balance type games. We have events for all ages and everyone gets a ribbon. Who wouldn’t want to go fishing on a hot summer day? Our Day Camp has a fishing trip every summer, so kids can learn about fishing and just have a good time. They also have a cook out and other fun activities/games. The kids also seem to find other things to catch like tadpoles, crawdads, and an occasional frog! We welcome autumn with a visit to a sea of pumpkins. It’s amazing how many pumpkins the children will check out before they finally settle on one! The rest of the activities will vary depending on the location. Some pumpkin patches include harvesting other vegetables, warm cider, hay rides, corn mazes, or other farm type fun. We have dress up days in conjunction with events, holidays and curriculum themes for the week. What fun! Some of the favorites are: western wear for Rodeo week, Wacky hair day, and Dress backward day. Kids love to watch an ice skating show, but when it is full of Disney characters, it’s twice as nice. We generally take the preschool aged children one or two times per year. Every summer the Day Camp heads out to the old ball game to see the Rockies play. We choose a covered area so the children are comfortable in the heat or if there is rain. If you haven’t been to a Rockies game you may not even realize all the entertainment that goes on besides the baseball. How many times can we see ourselves on the Jumbo Tron this year?? Summer just wouldn’t be complete without a trip to Water World. The Day Camp will go there every summer. There is so much wet and wild fun to be had with your Day Camp friends! In addition to Water World, each school’s Day Camp visits other swimming pools or smaller water parks. Children can also take swimming lesson during the summer. Nothing beats the thrill of an amusement park, so we take the Day Camp to the tame rides and the seasoned Day Campers get to experience the thrills of the big rides. All ages seem to like the getting wet activities. It is a great start to our summer Day Camp. Children have the opportunity to take summer swimming lessons. We transport them to local pools were they are taught by the swimming instructors. Besides learning to swim, they also learn about water safety. These are important lessons of childhood, and once children learn to swim, they will really enjoy pool play more because they are no longer scared of the water. Each school will also offer other lessons based on child/parent interests or seasons. They may include things like dance, tumbling, sports, martial arts, or similar activities. This gives kids an opportunity to see where their interests lie. Stingray Club is for school aged children and operates during the school year. They take about two field trips each month. These fieldtrips vary by school and encompass a wide variety of activities. They may include things like a factory tour, mall scavenger hunt, movie, ice/roller skating, rock climbing, laser tag, mini golf, museums, bowling, and more. We proudly fly the American flag daily! The children have a small ceremony were they recite the “Pledge of Allegiance” and raise the flag. It’s never too early to start learning about patriotism! Every year we take the preschool age children to see the Ringling Brothers and Barnum & Bailey Circus. The circus offers a huge variety of acts including lions, elephants, horses, zebras, birds, clowns, juggling, illusion, acrobatics and much more. Young children are always interest in things they can do when they grow up or in the special talents of people in our community. Guest speakers give children exposure to new and interesting things, and make their day special. Besides having special visitors, our kids are sometimes the guest. They may visit the local Fire or Police Department, see behind the scene at a local grocery store or restaurant, or visit a nursing home for caroling or Valentine cookies. Join Captain Hook and enjoy his delicious and nutritious breakfast club. Made fresh every day and approved by our nutritionist and the CACFP(Child and Adult Care Food Program), you cannot get a better breakfast for the money. The cost is $1.75/day or $8/week. The annual Luau is our way of saying “Thank You” to all of the wonderful families that attend our schools and to promote family fun! The evening includes a BBQ with lots of great food and activities like inflatable bounce/obstacle courses, face painting, games, tumble boogie, limbo contests, cotton candy, snow cones, and other fun things. This is a large event generally held at a park or other event center during the summer. The owners of LPL do all the cooking! The kids are always delighted to share part of their day with Grandparents. Grandma and Grandpa have a great time too having lunch, maybe making a craft, and seeing how their Grandchild spends their day. The LPL schools are all transformed for our annual Halloween carnivals. Each school will have a spook house, carnival games, cake walks, treats, and other fun haunting. The kids and adults can sport their costumes and have a fun family Halloween Celebration. Many families use the carnival as a substitute for Trick-Or-Treating. One week before Thanksgiving, each school has its own Thanksgiving Feast complete with Turkey and all the trimmings for the kids and their families. The kids get to help in some of the preparations and make costumes for the event. Check Out the Festivities at the Littleton location! Each December, our schools have a Christmas Program for the kids to show off their talents and experience performing. They start early practicing their songs and making costumes. Even the babies get an opportunity to get in on the fun. Santa always pays a visit too! Kids have so much fun when Mom (or Grandma) spends time with them at school celebrating how special Mom’s are. The children get to present Mom with a carnation. Everyone loves an ice cream social, but having one at school with Dad is extra special. We also launch balloons with notes inside and we see how far they travel. Our Parent’s Night Out (PNO) provides a Saturday Night Babysitting service, so parents can enjoy some alone time. Each PNO has a fun theme of activities that are exciting and different each month. Each center has one PNO each month, but Parents (and their friends) can utilize any this service at any of our centers. This means there are several Saturday nights to choose from. Dinner is available for the kids at an additional cost. Parent’s get to enjoy a night out knowing their kids are having fun and being cared for by a professional childcare staff! Why spend your valuable family time running the kids around for a hair cut? We have professional stylists come into our schools and give haircuts at a reasonable price one-two times per month. Parent’s sign up for this service and give instructions to the stylist about the desired haircut, so even if your child wants that Mohawk, it will be you who chooses the style! Each year our centers host a New Year’s Party and Sleep Over for kids. We want to give parents the opportunity to enjoy their New Year’s Eve celebration while keeping their kids entertained and safe. It is particularly hard to find a babysitter for New Year’s Eve. This service allows you to enjoy your night out knowing your kids are safe and cared for by professionals. The kids have their own party. We turn the clocks back and celebrate the New Year at 9:00 p.m. The kids spend the night, and have breakfast before being picked up. We have portrait photographers take individual portraits of the children each Spring and Fall. There is no obligation to purchase portraits. In addition, we invite all families to have a portrait taken during the Fall, on a Saturday. Each family that has their portrait taken receives an 8X10 portrait, complements of LPL. This is just another way we say “Thank you” to all of the families that attend at LPL. Enjoy a fresh cup of Joe on your way to work! We all know that mornings are hectic when you have kids, so let us make the morning coffee for you to enjoy after dropping off the kids! Look for this cute little critter in our front lobby. This kid friendly seal is balancing a ball on his nose. He dispenses hand sanitizer for children and parents as they enter and exit our schools. He stops the spread of germs between home and school and helps kids learn about the importance of hygiene. We hire the Stretch-N-Grow company to provide age appropriate exercise to the children in our schools. Kids get to develop motor and large muscle skills, learn about exercise, and have tons of fun. The cost is included in the tuition. We open our doors at noon, one Saturday in December, so parents can get some Christmas shopping or other preparation done. We know how strapped for time families are during the Holidays, and how hard it can be getting prepared for Christmas with children in tow. We normally combine this event with our monthly Parent’s Night Out, so our schools will be open for babysitting from noon until midnight. The real Santa loves LPL, and he visits each of our schools. We take a portrait of each willing child in attendance and give that portrait to you, free of charge. You can also have more portraits printed, enlarged or made into Christmas cards at your local Walgreens. We provide this service, so you can avoid the long lines at the mall waiting for a photo with Santa! We have a nautical theme that runs throughout our buildings and playground. Many schools also have aquariums mounted low to the ground for easy viewing. The children find the fish fascinating and calming. Our menus have been designed to follow the Child and Adult Care Food Program. This program is designed to provide a variety of healthy and nutritious, kid friendly foods. The goal is to improve the health and nutrition of food or kids in our care, while promoting the development of good eating habits. Our program has been approved, and meets the regulations governing child nutrition programs on quantity requirements and/or by definition. It meets the food and drug administration’s standards of identity. The program meets the USDA’s standards for meat and meat products and meets administrative policy decisions on the crediting of particular foods.